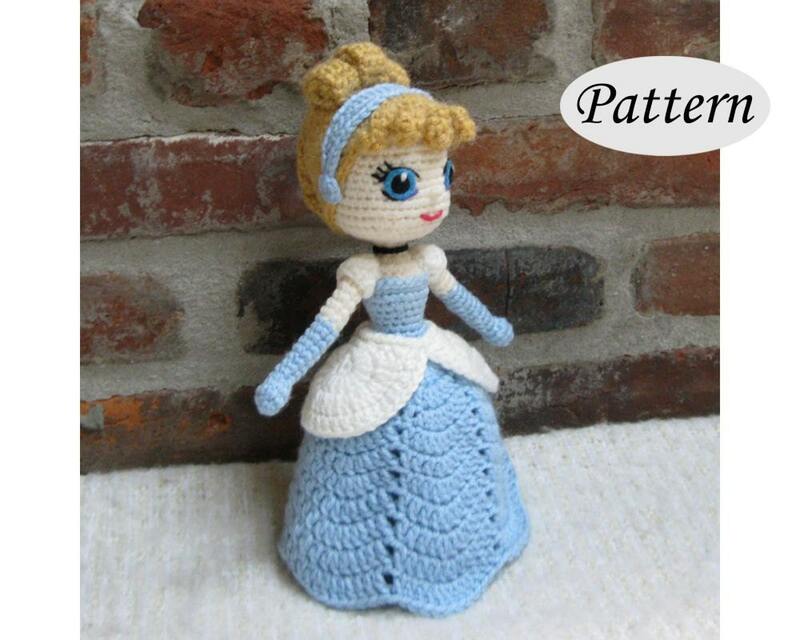 This is a crochet pattern for the beautiful Cinderella princess. Cinderella has large, embroidered eyes and wears her gorgeous ball gown. The hair is styled in its original look with the blue hair band. Includes one PDF file, 23 pages. Intermediate - you will need to know how to crochet stitches like single, double,and treble crochets, starting with a magic circle, and increase and invisible decrease techniques. You will learn how to embroider the eyes and to make and style the hair. There are lovely tiny details and the assembling and embellishment requires love, patience and time. I put a lot of patience into my patterns, but human mistakes are always possible. Please contact me at crochetcutedolls.com if you have any questions. Copyright © 2016 Crochet Cute Dolls. Très jolie et représente un défi intéressant !